Retroviruses, a broad category of viruses that infect humans and other vertebrates, have much greater diversity than previously thought, according to new research presented in PLOS Pathogens by Xiaoyu Xu and colleagues at Nanjing Normal University, China. Retroviruses include HIV and other viruses that cause disease in many different vertebrate species. Most retrovirus research has focused on mammals and birds, but retroviruses also infect many other vertebrates. Thus, the overall diversity and deep evolutionary history of retroviruses has been murky. To improve understanding of retroviruses, Xu and colleagues examined molecular "fossils" in vertebrate DNA. These "fossils" can arise from the normal infection cycle of retroviruses: retroviruses store their genetic information in RNA, but when they infect a vertebrate cell, they transcribe their RNA into DNA that integrates into the host genome. If this occurs in a vertebrate reproductive cell, the viral code can be preserved and passed down to offspring through many generations. The preserved genetic code is known as an endogenous retrovirus. The researchers looked for and analyzed endogenous retroviruses in the genomes of 72 fish species, 4 amphibians, and 16 reptiles. They identified more than 8,000 endogenous retroviruses and were able to reconstruct full or partial genomes for about 450 of them. These findings greatly expand the number of known retroviruses and suggest that the diversity of non-endogenous retroviruses passing between non-avian/mammalian hosts today may be far greater than currently thought. Phylogenetic analysis of the genomes suggests that, during their evolution, many of the non-avian/mammalian retroviruses frequently switched from one preferred host species to another. The analysis also shows that retroviruses frequently transmitted between water and land species, suggesting multiple aquatic evolutionary origins. 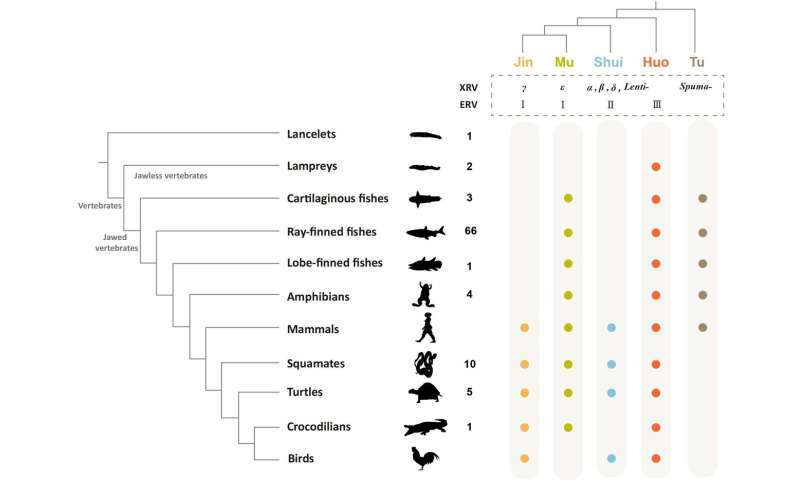 The 92 vertebrates in this study represent only about 0.2 percent of the diversity of non-avian/mammalian vertebrates, so it is likely that many more endogenous retroviruses remain undiscovered. Uncovering their diversity and evolutionary history could help inform ongoing efforts to predict, prevent, and minimize retroviral disease outbreaks.